The eastern chipmunk (Tamias striatus) is a common sight throughout its native range. During their lives, eastern chipmunks may encounter several different animals, having different types of interactions. They’re a valuable prey item for many predators, but they also play the role of predator for many smaller animals. These small squirrels average just under 10 inches long, including tail, and weigh in at around 3 ounces. Although they’re small, the eastern chipmunk is actually a bit big when compared to other chipmunks. These reddish-brown rodents are conspicuously marked with buff-colored bellies, black stripes along their backs and black-tipped tails. The eastern chipmunk’s range includes most of the eastern United States and southeastern Canada. Like many rodents, chippies are omnivorous, but most of their diet is nuts, seeds and fruit. During the summer, however, they’ll eagerly consume several animals. Earthworms and insects are among their favorite animal meals, but they’ll also sneak in bird eggs if the opportunity presents itself. It’s not uncommon to see adult birds chasing away these pesky critters while protecting their nests. 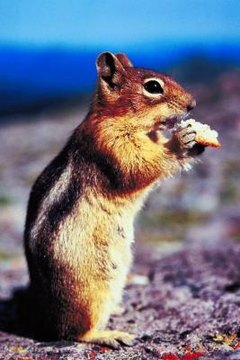 Eastern chipmunks also interact with several animals as a prey creature. Many larger animals live on small rodents and chipmunks are no exception. The red squirrel is another small squirrel, about 2 1/2 times heavier and not too much longer than their chipmunk cousins. Omnivorous by nature, these small, red squirrels will take chipmunks in the absence of other food sources, although this may be rare. Other predators of the eastern chipmunk include several species of hawk and owl, weasels, raccoons, foxes, coyotes, bobcats and domestic pets. Chippies interact with man in a number of ways. It’s not uncommon for these small creatures to dig up bulbs or roots or begin burrowing near homes and in gardens. They’re often considered pests when they take up residence near homes and gardens. Some people thoroughly enjoy watching chippies run about, scampering through the lawn looking for food or calling to their kin with their characteristic “chip chip chip” call.